The world's fastest vehicles - See what's powering some of the speediest machines on Earth . Land and sea machines - See how we're trying to make cars become eco friendly and submarines go deeper than ever before. In the air - From stealthy fighter jets to luxurious double decker planes, discover how you'll be flying on your future holidays. Historic icons - The vehicles that changed the world have left their impact - we look back at the vehicles that made the difference. 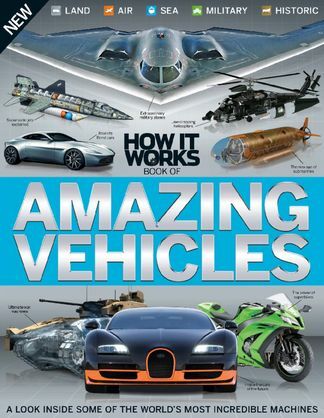 Be the first person to tell us what you think about How it Works Book of Amazing Vehicles Volume 1 and you'll save $5 on your next purchase!